According to many of those who take this short tour through the Ponidzie region - it is the best extension of the classic Dunajec-weekly tour. 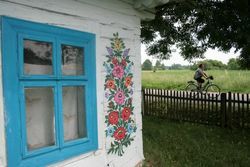 It offers a wonderful contrast to the mountain landscapes: authentic, rural Poland with quiet, flat country roads ideal for cycling. How can "Ponidzie" best be described? A sparsely inhabited part of the Nida River valley about 70 km northeast of Krakow. 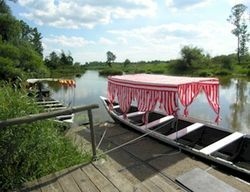 This name (spoken "Ponidshyeah") is similar to the Romanian Dobruja - the Danube delta - but not only the names are similar. The Nida also forms a small and marshy inland delta here. The hallmark of Ponidzie is a natural wonder of a different calling - there are about 50 to 100 m high gypsum hills here that are overgrown with unusual steppe vegetation. These include delicate wild blue flax flowers and graceful feather grasses dancing in the wind that are favourite motives of photographers. At Ponidzie you can enjoy natural beauty at its best with no industry in sight and the picturesque villages are connected to one another by a net of small asphalt roads making Ponidzie an attractive area for leisure cyclists. There are also small karst lakes and old gypsum depressions to swim in. Two small spa towns, Busko and Solec have good accommodation facilities and are famous for their mineral water and therapeutic mud. This cycle tour has been planned so that one can start on the Saturday following the return from either the Dunajec or Sudeten tours as the case may be. 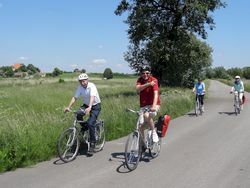 This trip is offered only as an individual cycling trip (without a guide). We provide detailed maps and description so that you will have no problem finding the route. We meet at 10:00 a.m. at the hotel. After handing out the cycles there will be a circa two hour long bus ride to Sobkow. You can have lunch at a restored house that once belonged to nobility on the Nida. You then cycle along the river past the picturesque ruins of a former knight's castle. Our goal is the spa resort of Busko Zdroj, a small town with an attractive market square and a spacious spa garden with pavilions from the 19th century. You will be staying here for 2 nights. You will cycle back to lowland Nida where the river meanders through particularly beautiful alluvial landscapes. There are the black and white cows, storks, lapwings black-tailed godwits. There is a museum to visit in Chroberz and Krzyzanowice has a gypsum hill which you can climb for a bird's-eye view of the region. You ride past a few villages and steppe reserves with flora unique to the region. The reserve at Skorocice is perhaps the most interesting one. An underground brook in the gypsum rocks has hollowed out an impressive gorge and made karst depressions. The final goal for the day is Solec Zdroj, a small spa Village. You will stay here for the next 2 nights. This is the longest leg of the tour and is in the very flat Vistula country. Flat but not monotonous - well-kept pollarded willows border the roads creating a green tunnel over cyclists with their branches. You cross the Vistula river by cable ferry at Nowy Korczyn. Your goal today is Zalipie village, famous throughout Poland for the colourful flowery motives decorating the walls of its houses. You leave Solec right after breakfast and travel back to Krakow. The latest expected time of arrival is 12:00 p.m. when most of the trains or planes will still be available. Of course, it is also possible to extend your stay in Krakow. New for 2017: We offer accommodation in category A in two luxurious 4-star hotels with excellent cuisine, SPA and swimming pools: Słoneczny Zdrój (Sunny Spa) in Busko and Malinowy Zdrój (Raspberry Spa) in Solec. A very easy tour: About 80% is on asphalt and the rest on dirt roads. The landscape is flat or gently undulating. There are only a few short uphill and downhill stretches near the gypsum hills. 4 overnight stays. All rooms have their own shower and bathroom. Baggage transport between the accommodations. Lending out information material: set of 1:50.000 maps and route description. .